This gift box benefiting the Tory Burch Foundations features a curated collection of six products made by women entrepreneurs (including a key fob, a bracelet, chai tea, a travel candle, and more). The Tory Burch Foundation empowers women entrepreneurs by providing access to capital, education programs and networking events. We just can’t get enough of Clare V.’s clutches. When you buy this limited-edition Suffragette clutch (a collaboration with Focus Features for the new film starring Carey Mulligan, Helena Bonham Carter, and Meryl Streep), 20 percent of the proceeds go to Every Mother Counts, a non-profit organization dedicated to taking actions and raising funds that support maternal health programs around the world. 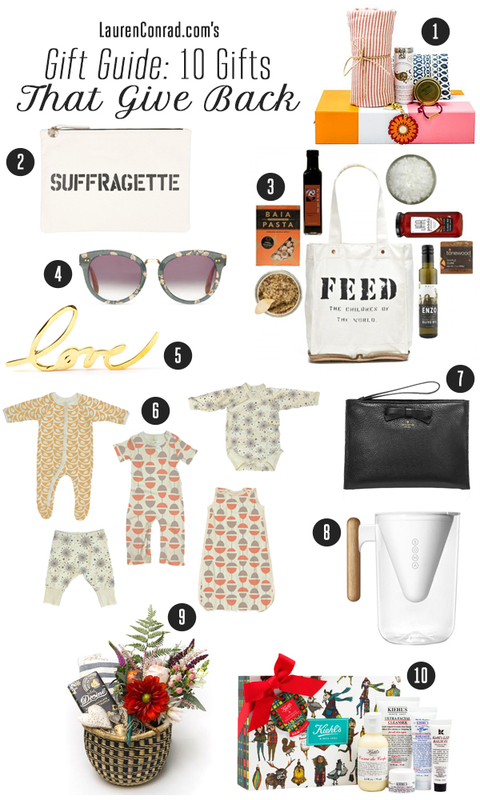 This gift bag collaboration between Lauren Bush Lauren’s company FEED (which helps fight hunger with every product sold) and the indie food gift hub Mouth, provides 100 Vitamin A supplements to those in need with every bag sold. TOMS may be known for their slip-on shoes, but these vintage-inspired sunnies are at the top of our wish list. With every pair of eyewear you purchase, TOMS will help give sight to a person in need. This decorative paperweight is part of West Elm’s 2015 collaboration with St. Jude Children’s Research Hospital. Fifty percent of the purchase price goes directly to St. Jude. All of Olen Organic’s baby clothes bundles come with several sweet pieces made right in downtown Los Angeles from naturally soft GOTS-certified organic cotton. Once the items are outgrown, you can use the mailer envelope and pre-paid shipping label that Olen provides through givebackbox.com to donate them to a new home. Part of Kate Spade’s On Purpose collection, this chic clutch was crafted by a group of 150 talented artisans in Rwanda. Through this artisan partnership, Kate Spade is creating a ripple effect in their entire community, economic stability, self-sufficiency, and confidence in the future. Not only is the Soma Water Filter chicer than any other filter we’ve seen, but for every Soma filter purchased, clean drinking water is donated to people in need through Soma’s nonprofit partner, charity: water. If you haven’t already heard of Gratitude Collaborative, they are an amazing gift box company that feeds hungry children in the U.S. with every box they sell. One hundred percent of the proceeds from this gift basket collaboration with The Little Market (which contains a chocolate bar, a striped hand towel, a beaded heart ornament, a heart wine bottle stopper, a bouquet of flowers, and more) are donated to the Downtown Women’s Center in Los Angeles. Kiehl’s is one of our old standbys when it comes to skincare. For this set— which includes Creme de Corps, Lip Balm #1, and three more products—100 percent of Kiehl’s net profits, up to $100,000, will provide 1,000,000 meals to families this holiday season through Feeding America. It’s pretty nice to be able to get your holiday shopping done and give back at the same time!